Contour Heating Products Ltd > News > Are LST Radiators For Schools Durable? Are LST Radiators For Schools Durable? Schools are busy places. Classroom sizes are getting bigger every year. For facilities in schools, this means the need to be more durable against day-to-day wear and tear is becoming more and more critical. Durability is important for safety, keeping costs down and for minimising the disruption from people having to come into school to complete maintenance work. Contour’s LST radiators with safety in mind. Ensuring that product durability is maximised to limit the risk of damage in busy school environments where children are likely to be rushing past it, banging bags on their way past and leaning on it during break times. Our LST radiators are made out of a 1.5mm Zintec mild steel to ensure a more durable performance against the high demands of school environments. This is also a benefit of resisting corrosion, further enhancing the durability of the radiator. Contour radiators don’t include the use of proprietary grilles and are supplied as single-unit constructions. This makes them more durable because of the risk of screws or bolts that would fit together a multi-piece unit at risk of coming loose over time. With a single-piece unit, this isn’t a problem. The radiators come with additional folds in the radiator guard to give it a higher level of strength making it more resistant to the day-to-day wear and tear of being in a busy school environment. For additional durability, Contour LST radiator casings are powder-coated with BioCote® infused polyester powder. The average thickened of the paint on our BioCote® protected LST’s is 60 microns, both inside the radiator and across the exterior. This makes the product more durable in the fight against bacteria with microbial additive reducing 99.5% of microbial colonies on a radiator casing. Diseases such as H1N1 influenza virus, Salmonella and Streptococcus faecalis are often found on radiators. Protecting students from these illnesses with a durable product is a priority for Contour. BioCote® inhibits the spread of bacteria throughout the expected lifespan of a radiator, protecting against these illnesses and creating a more durable, long-lasting product that keeps school environments safe for all. Contour offers a range of additional options when you purchase LST radiators to further boost the durability of the products for your school. We offer stainless steel options that are stronger and more resistant towards damage from falls. For wet rooms, we offer 2mm aluminium which is more resistant in moisture or 2mm steel for dry environments. 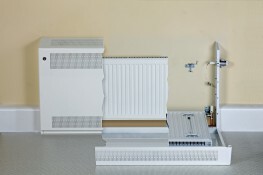 Contour can also provide magnelis in their radiator covers. This has the strength of steel, however, when it’s cured it goes through an additional treatment stage that is similar to galvanising. This makes the material more resistant to rust. Additionally, all of our radiators come with a 10-year warranty and a 5-year warranty on our covers; giving you peace of mind.